Did you know that some people find clowns more scary than funny? Of course you did. For quite a while now, it’s seemed that having a fear of clowns is a much more common trait than is being entertained by clowns. We’re not sure where that comes from. What’s so creepy about a clown, anyway? All they want to do is slather themselves in their makeup and make people laugh. If that’s not an admirable goal, we don’t know what is. Maybe it’s about time we all eased up on the whole “clowns are evil” thing and gave some friendly, funny people the respect they’re due. Oh wait, scratch that. Forget we said all those things, because we just got a look at this guy. Despite his vaguely familiar face, this clown isn’t just another bozo. He’s got bad intent written all over his bright white, blood-smeared face. This latex mask features matted red hair, a big round clown nose, and an oversized mouth section to let your brightest smile (or sneer) shine through. If fellas like this are really representative of the clowning community, we absolutely retract all that stuff we said before. 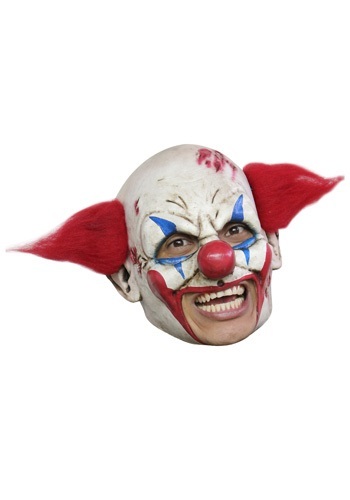 If we see you coming our way wearing this mask, we’re steering as clear as we possibly can.